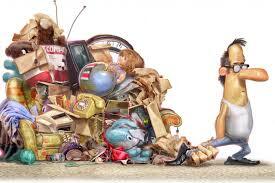 Kelowna Junk Removal - Clear Your Clutter for Cash! Clearing out the clutter in your home? Make your hard work worthwhile by earning some cash. Check out our tips on how to host a seamless and profitable garage sale. “If you haven’t used it or worn it in the last six months, you’re not going to,” advises Peter Walsh, Oprah’s anti-clutter guru and host of TLC’s Clean Sweep. “Get rid of it.” And it’s not just so we don’t end up on Hoarders — there’s cash buried in that treasure! The yard or garage sale is a North American tradition. Not only does it let you turn trash into cash, it’s also a great way to meet the neighbours. The key is to make it fun and well organised. Here’s how to do it. Flying solo might be your preference, because there is less to go wrong and fewer folks to accommodate. But a block or street sale is a real attention grabber and when bargain hunters hear that there are several houses involved, they’ll show up in droves. Many hands make light work and when the neighbours are involved just watch the signs go up all over and the balloons appear at intersections. When everyone pitches in and pools resources — including legions of children — word will spread far and wide. Bonus: Block sales often evolve into block parties. Don’t spend a penny on advertising, but do get the word out. Use free classified adds such as Craigslist, Castanet and Kijiji, post on Facebook and post good, old-fashioned paper signs all around the neighbourhood. Do a Google search with the name of your neighbourhood, too — there may just be a community website where you can post. Also, libraries, grocery stores and other shops may still have notice boards. Remember to include a rain date, start and finish times, address and a few tantalising details of what’s for sale. Make sure to mention that early birds will not be welcome or you will have overzealous pickers knocking at your door at the crack of dawn. Don’t let a little rain wash away your dreams of decluttering. If you own a portable gazebo, set it up out front just in case. Or hold the sale in an open garage or shed. Failing all of that, set a rain date and include it in your advertising. If you price items on the fly, when folks are standing right there in front of you, you’re more likely to undervalue the item. Take your time and pick a reasonable price. You want to get rid of it, but you don’t need to give it away. If you price it a little higher than you expect to get for it, you will have some wiggle room when folks haggle — and they will. And put price tags on everything. Invest in a roll of masking tape for makeshift labels. Add a snack table, bake sale and drinks stand. It’s fun, attracts visitors, generates a wee bit more money and, best of all, if you have little helpers, it gives them something to do and makes them feel part of it all. Plug in that old boom box and play some tunes. It’ll make the time go by faster, alert the neighbourhood to what’s going on and create a happy mood. Select a particularly appealing item — something new and still in its original packaging, for instance — or a delicious baked goodie, then sell tickets for 50 cents. It’s fun, generates more income and is a job that can be handled by one of the kids. Both days have pros and cons, but we think Saturday is preferable. It gives you a second weekend day to extend the sale if you wish, and Sunday can also be the appointed rain day for Saturday’s sale. “Keep like things together and arrange them well,” suggests Walsh. Organizing your goods neatly and well like they would be in a store makes them easier for people to find and more appealing. After you have hosted your garage sale, give Dump It! 365 a call! We will come pack up anything you don’t get rid of, donate everything we can and dump the rest for you. Give us a call today 250-807-7772.